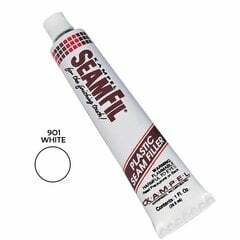 Seamfil laminate Repair fixes nicks, fills seams and makes gouges disappear with an easy one-part system. Repair nicks, fill seams and make gouges disappear with this one-part system. SeamFil bonds mechanically to the substrate of laminate and dries hard, becoming a permanent part of the laminate surface. Bonds mechanically to laminate substrate and becomes a permanent part of the laminate surface.